Apart from the Greek capital Athens in the south, Thessaloniki is certainly the second largest metropolis in Greece in the north and also always worth a visit. The capital of Macedonia, including the Chalkidiki peninsula, has a population of over 300,000. Many roads and highways in the city itself make it possible for you to reach all points of interest quickly with a rental car, independent of local means of transport, and during your city trip to Thessaloniki you can also have a beach day outside the city. On arrival at the airport of Thessaloniki SKG you will be provided with the desired and prebooked car rental from your local car rental company. This means that you can start your holiday in Thessaloniki directly from the very beginning, flexibly and independently of your car, which you could rent cheaply by comparing prices. For information on the various car rental offers at Thessaloniki Airport SKG, please refer to the online price comparison. 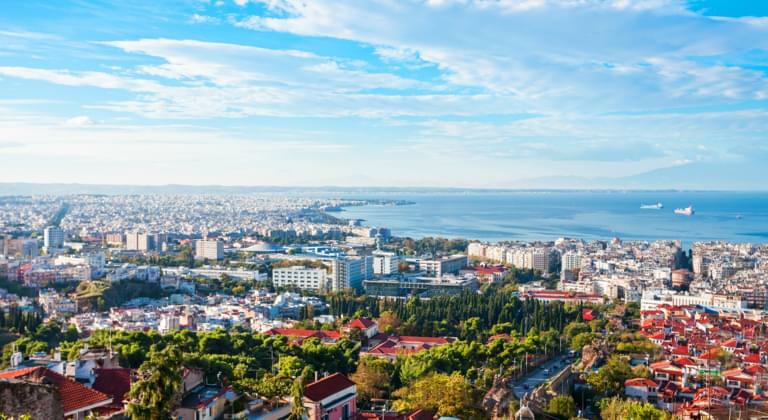 And since Thessaloniki has good transport connections in all directions of the country, you can also start a round trip through Greece with your rental car. The peculiarity and already an anticipation for the approaching vacation is that the airport is located directly at the sea and the approach of most of the planes that land here already takes place directly over the sea. On the one hand you can see the big city, which appears white due to the houses in the sunlight and on the other hand the sea, when the plane arrives at the airport and starts to land. Thessaloniki SKG Airport was extended and rebuilt until 1997, further renovations to serve even more passengers are in the planning phase. However, the airport building has not been enlarged very much, so the distances here are all very short. The departure lounge and arrivals hall are located on two different levels, with the departure terminal on the upper level and the arrival terminal on the lower level. Both levels are connected by an elevator and a staircase. Toilets and a snack bar are also available on both levels. Several small shops are also located on the upper level in the departure terminal. There are parking spaces around the airport, where you can also pick up some of the rented cars. Arrival is on the lower level of Thessaloniki Airport. If you arrive by plane, you will enter the building directly from the airport bus, where you will find the baggage carousels in a relatively small room. From here you go through the lock and you will also see the exit directly from the airport building. If you have been able to book a cheap car for hire in advance via the Internet, then your car rental company's pick-up point is located either on the upper level at the airport in the departure area, or in the immediate vicinity of the airport in the business park. Information on this can also be obtained from the airport staff. The airport of Thessaloniki SKG Airport has perfect traffic connections for continuing your journey with a rented car, which you could rent in advance via the Internet. Otherwise, there is only one bus service to the city and taxis are available. The train station, which is about 15 km away, as well as the long-distance buses to all regions of Greece can only be reached after an hour's drive by bus 78 and 78 N.
However, if you have found a cheap rental car in the price comparison, then you can quickly and easily get started with your car rental thanks to the nearby city highway, which runs around Thessaloniki and is equipped with connections in all directions of the country. The city has a well-developed and above all modern road system. The expressways and city highways, which you can drive on with your cheaply priced rental car, are generally two to three lanes, which is also useful in view of the high traffic volume in Thessaloniki. The shuttle from the airport to the ring road is about 2 km long and you can change from this city railway to the state motorways with your rental car. The traffic rules in Greece are similar to most parts of Europe. This is also the case to the right in front of the left, unless the traffic signs indicate otherwise. You may be confused if you are traveling with a rental car, which you could rent cheaply via the Internet at a car rental company, which has stop signs on some roads, but where the intersecting priority roads are not signposted for the right of way. Always drive with foresight and caution. Keep to the speed limit if you are travelling with your rental car, and don't let the locals push you, because the penalties in Greece can be much higher in case of a violation than in our country. The Greek police make regular traffic checks. Slow-moving vehicles often drive on the hard shoulder of the motorway to avoid disturbing other road users. If you listen to Thessaloniki, you will probably think of the White Tower, which overlooks the harbour and the promenade. But the pulsating city has much more to offer. Well-known boutiques are waiting for your visit when you drive into the city center for a shopping day with your rental car, from your car rental company at the collection point at SKG Airport. But the famous Hagia Sofia is also waiting for your visit and can be reached quickly with the rental car of a car rental company, which has its pick-up station at the airport. If you are interested in ancient Greece, it is worth visiting the Archaeological Museum and the rotunda, which is located in the immediate vicinity of the Galerius arch built by the Romans. Thus, Thessaloniki is above all a place full of history, in which the different peoples used to give themselves the handle and create spectacular buildings of different eras. If you have received your rental car at the airport, which you could rent cheaply on the Internet, then you can not only explore the city but also drive into the surrounding area. On the one hand, the beaches of Chalkidiki are about 30 km away for a day at the sea, on the other hand, you can take the A2 in the direction of Athens and here in the area around Katerini, below the legendary and mostly snow-covered Olympus, about 50 km away, you can visit a beach. By renting a car you have the possibility to reach other Greek places of interest. So you also come via the A2 towards Athens through the Tembi Valley with its chapel built in a rock. If you then turn off in Larissa to the beautiful town of Trikala, inland, you can visit the Meteora stones with the monasteries. Although these are about 250 km away from Thessaloniki and the airport, it only takes about three hours to drive by car. If you don't want to return to Thessaloniki on the same day, many small hotels offer rooms here.